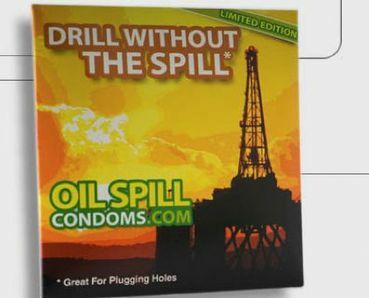 I guess those are at least symbollically appropriate, considering how badly we are being fooked by the spill. Buy a trusted brand (like Trojans). I wouldn't trust anything remotely connected to BP who, by the way, are responsible for the cost of the cleanup and reparations. Incidentally, condom afficianados may like to know, here in Scotland we have whiskey-flavoured condoms called McCondom (technically Gaelic for "Son of Condom", ironically). As they are alcohol-related, the packet bears the warning "Caution: Do Not Use While Driving". You'd think they'd be confined to souvenir shops as a novelty item, but no :). Makes me very proud, that does.